For ages the story of the ancient rivalry between two of Africas most bitter eternal enemies has been shrouded in the secrecy of darkness. For ages the story of the ancient rivalry between two of Africas most bitter eternal enemies has been shrouded in the secrecy of darkness. Each night is like a battlefield as this war of wits plays itself out between the hyenas and the lions of Savute in Botswana. Dereck and Beverly Joubert have studied and filmed the lions in Savute since 1981. Because of the unique privilege of working at night they have at last been able to bring to the screen the truth about how lions and hyenas behave in the darkness. 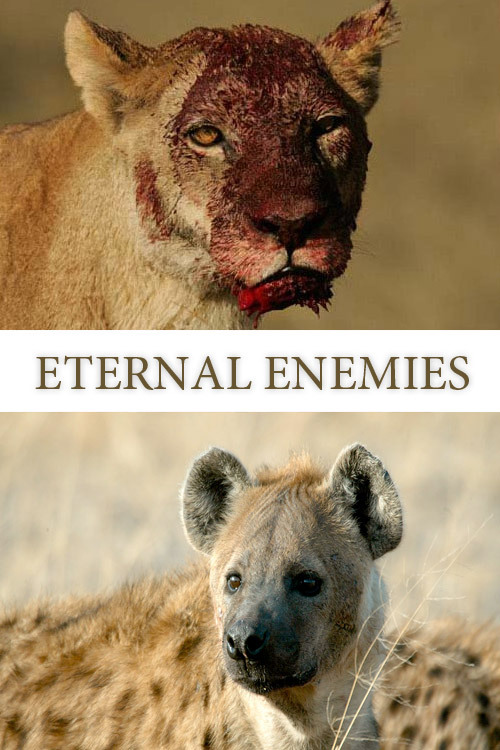 This is the story of one clan of hyenas and one pride of lions as they interact with their neighbours and with each other, surviving each night only by displaying strength and aggression in what can best be described as a blood feud between two eternal enemies. This has become one of the most popular wildlife shows ever produced with estimates of a quarter of a billion viewers so far, achieving almost cult status in many countries. The film works well as a first part with Ultimate Enemies for an all round in depth view into the lives of lions in Botswana.